Led dance floor hire is something I’ve recently started to provide throughout Scotland. A long time ago I used to hire wooden dance floors and the led dance floors I now hire are very similar. The only real difference is that the led floors have a power cable that makes them light up. The other major difference is that my old wooden floor had 3ft by 3ft panels and 3ft by 1.5ft panels and my new led floor has a combination of 4ft by 2ft panels and 2ft by 2ft panels. It has two different sizes of panels so that every second row is staggered and each row is locked by the following row. My led floor requires no tools to lay it or lift it as it simply clicks together. 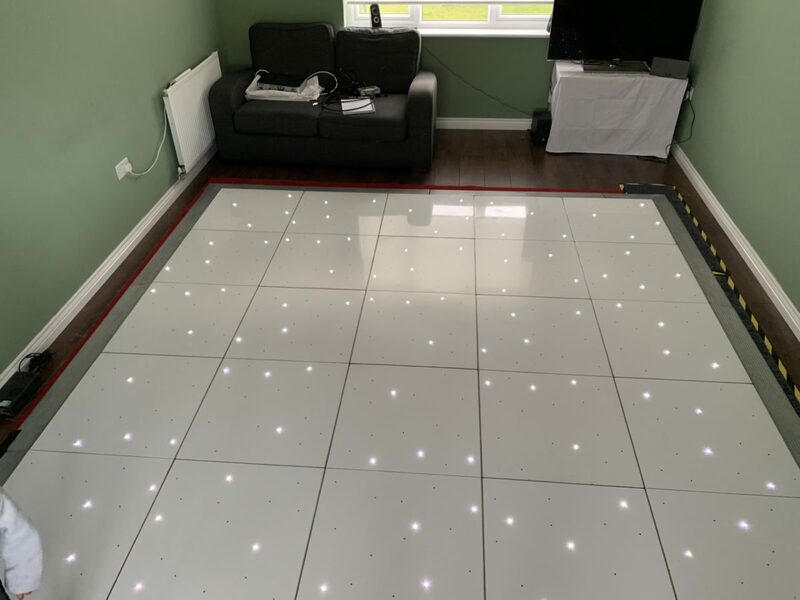 To lay a led floor takes around 45 minutes to an hour. To remove it is slightly quicker. 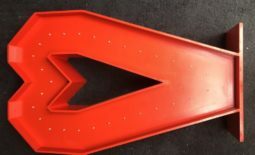 As of this week we will now deliver the led dance floor in custom flight cases with wheels on the bottom. This should make it quicker to deliver and will keep the dance floor more protected in transit. This will make it quicker and easier to deliver to all ground floor venues or venues with lifts. I’m always asked how I get my floors so shiny and clean so when I was at Keavil House Hotel in Crossford last week I recorded two videos. The first video was of the floor being cleaned and the second was the floor after it had been cleaned and polished and was about to be lifted and put in the van ready for the next hire. I’ve always been a perfectionist and like things to be 100%! I believe my led floor hire is the best in Scotland. 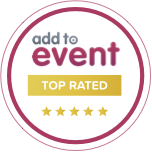 We are 100% reliable and are friendly and helpful and we bought the best dance floor you can buy for its reliability and quality. I bought a Grumpy Joe’s floor which everyone in the industry says is the best. It’s made in the UK and I know this to be the case as I was at the factory last week getting some panels repaired and had a guided tour of their production facility. A lot of people think that laying a dance floor is easy and although I may make it look easy it’s not. Total weight for a 20ft by 20ft dance floor is 685Kg. That has to be loaded into the van, then out again at the venue and then reloaded at the end of the night and then put back into our warehouse. So in one night you move 2.25 tons of floor and you also have to lay it, Polish it and then lift it, clean it, polish it and buff it before putting it back in the van and then into the warehouse. We currently have two 20ft by 20ft dance floors and a third multi coloured one is planned for next year. Over the last year I’ve experimented with lots of different cleaning fluids, polishes and methods of cleaning and I’m still looking at other methods. 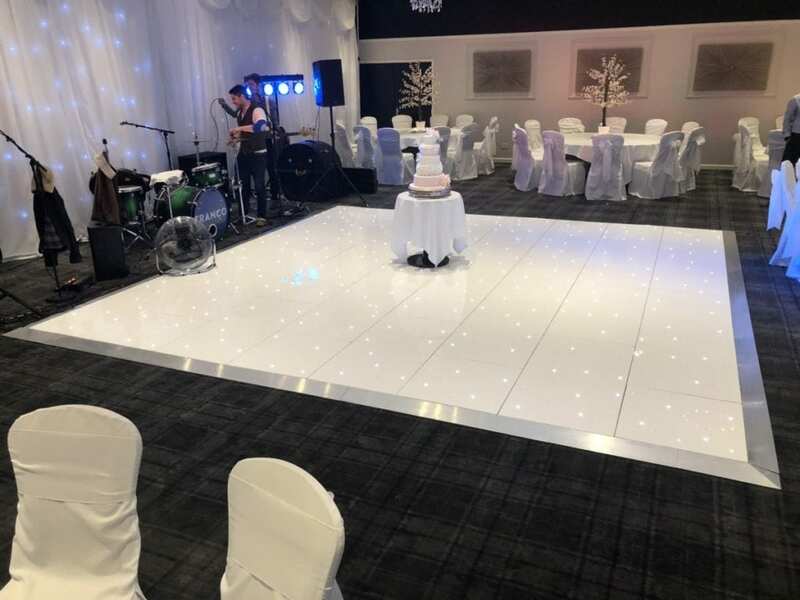 Every time you get a dance floor from Platinum Discos you’ll get a spotlessly clean floor with a highly polished surface that gleams! Here are some examples of our dance floor at various venues throughout Scotland. 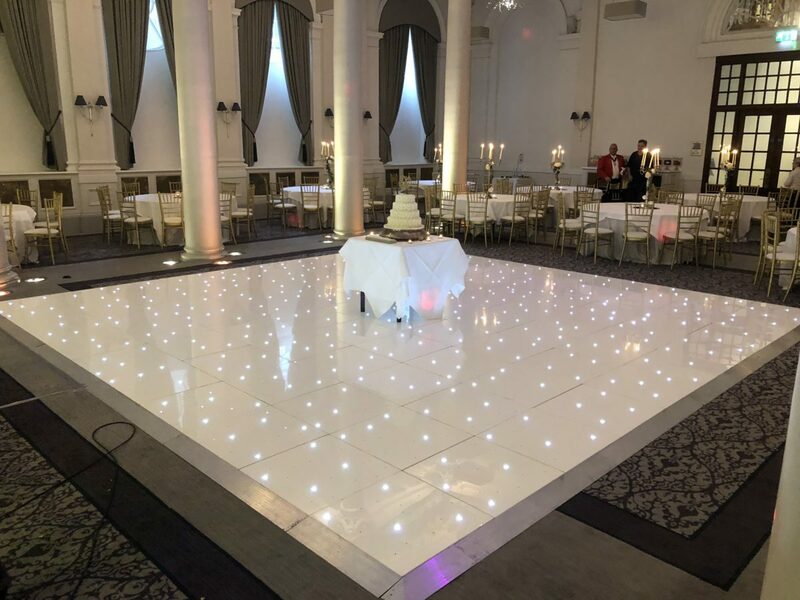 Led dance floor hire at The Principal George Hotel Edinburgh. 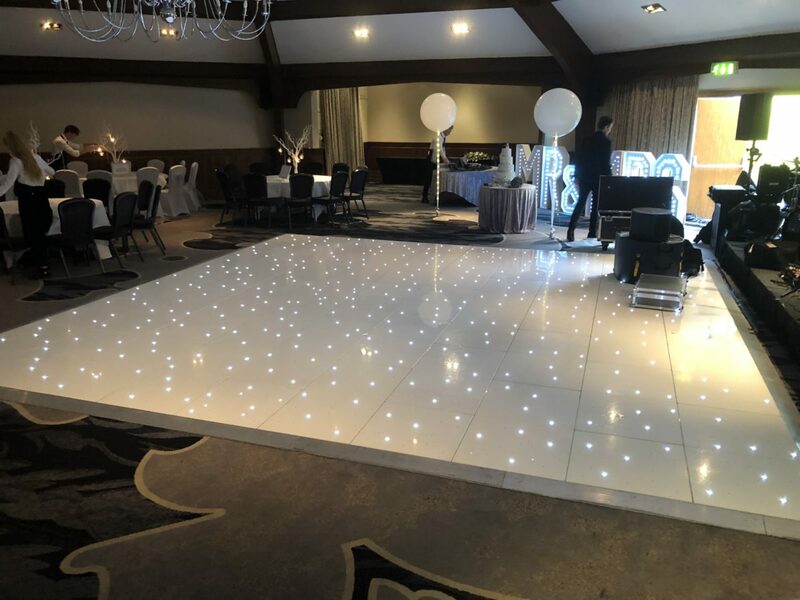 Platinum Discos supplies led floors throughout Scotland in hotels, clubs and private houses. We travel from Inverness and Aberdeen in the north to Dumfries and Gretna Green in the south and throughout the central belt from Edinburgh in the east to Glasgow in the west. Here is a photo of a led dance floor I supplied in a house in Musselburgh outside Edinburgh. To hire a led floor please fill in my contact form and remember to give as much information as possible and the size of floor you require. If you have any questions and you’d like a chat please call me on my mobile: 07472 287 151. 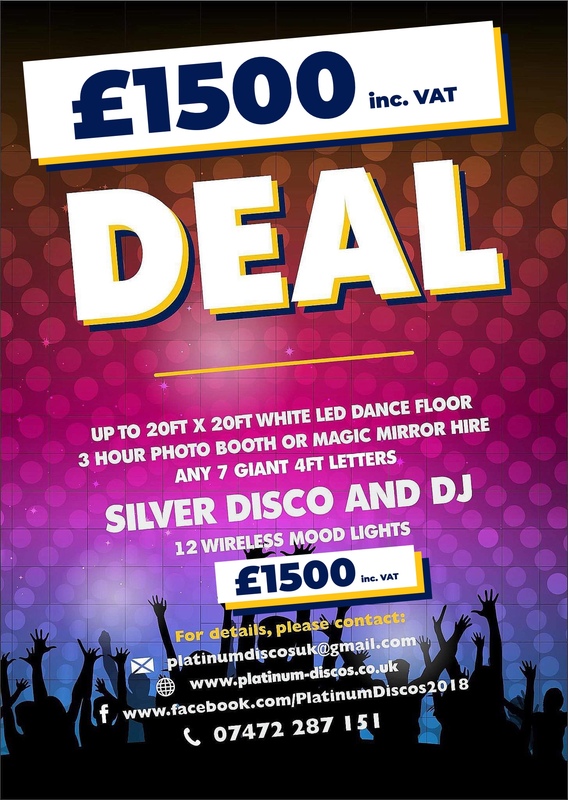 If you rent a floor from Platinum Discos we do some fantastic package deals. 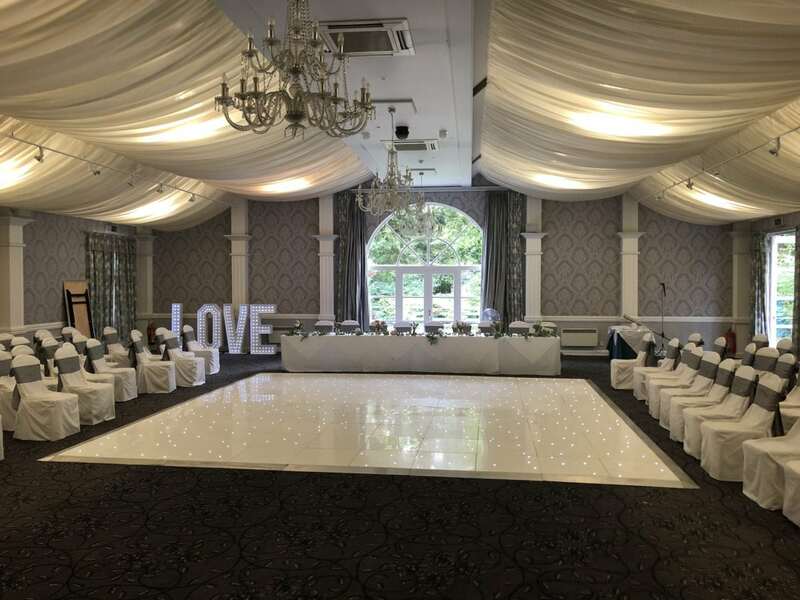 In general I offer a 50% discount on items such as giant letters, postboxes, backdrops etc when you hire a dance floor, disco or photo booth from us. I’ve recently improved on the special offer that I launched earlier this year and now for £1,000 you get a 20ft by 20ft white led floor, a 3 hour photo booth, a top class disco, 12 wireless mood lights and seven 4ft tall giant letters. This deal is incredibly popular! If you take this package deal anything else you order is half price! Here’s an article I wrote that tells you all about the £1,000 deal and includes Kylie the bride’s Review. One last thing, if you don’t want to be disappointed please book a good quality floor and not a cheap one!